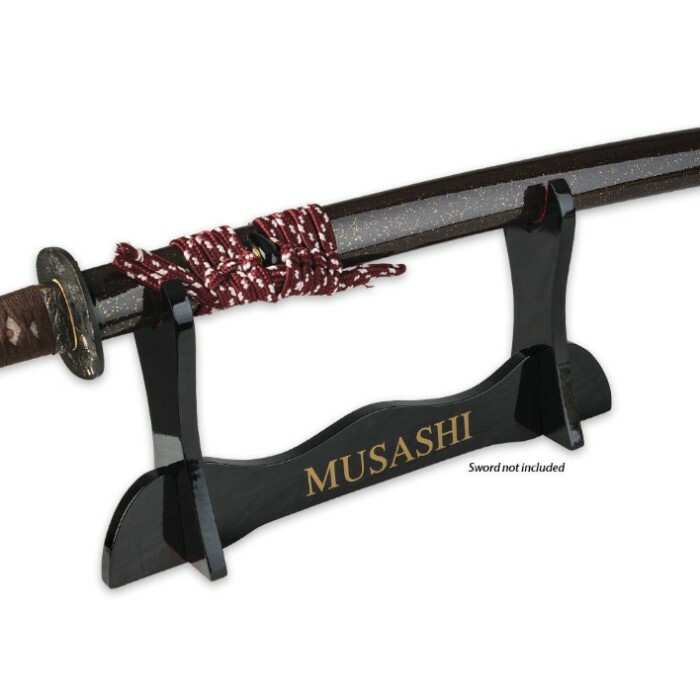 This beautiful wooden stand is a must for displaying your most prized samurai katana sword. It has a beautiful high quality black liquid polish finish for a more classy look. 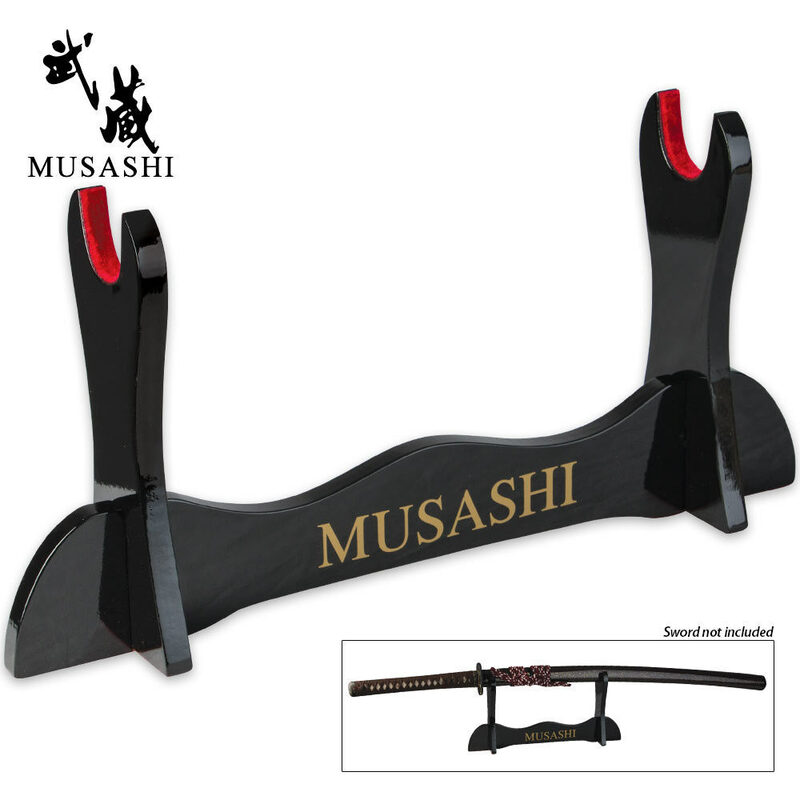 Musashi Japanese words are printed in gold on one side of the cross bar and the English word is printed on the other side. The katana sword holder has a red velvet rest to protect your sword. Easy to assemble and got here fast. Sturdy and just beautiful. It will definitely be the centerpiece of any room. Ordered 2 since it took some time for true swords to get another shipment, but they did make me aware of the product being instock. Great stand, lacquer finish is very nice....went together easily...amd my sword looks GREAT!!!!! Thank you again True Swords. Great stand! It gets the job done and looks good doing it. Very classy design. Now if they'd only make a double stand of similar quality I'd be set! This stand looks eally good with the Sparkling Ruby Katana. It was also really easy to put together, and it's sturdy. Very beautiful love it so much. very simple to put it together. love the semi gloss. worth every penny! My out of box experience was simple, it looks shinier and much glossier in person. The stand is simple to put together and very sturdy for the united black katana i purchased from True Site Corp. with it. The red velvet is a nice touch and has the velvet not only on the u shaped sword slots, but also on the bottom of the stand. This is very well worth the 9.99 i spent for it. Great accent for any darker colored saya/tsuka. A nice simple sword stand for a good price. The red velvet goes really well with a sword with a red cover and the assembly was very easy. A very stylish and simple sword stand. The red was a nice touch and I suppose it prevents scratching on the saya. Simple assembly, good looking stand. Worth the $10 I spent on it.